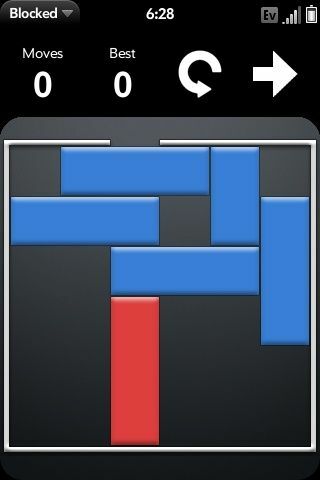 Blocked is a sliding block logic puzzle. The objective is to free the red block by moving the blue blocks out of the way. It currently has 100 puzzles in 3 difficulty categories. 50 novice, 25 intermediate, 25 expert, and 50 new puzzles yet to be sorted. There is also 4 different block themes. Default, cars, wood, and metal. It includes a drag-and-drop puzzle designer. Which allows you to create your own puzzles for your family and friends to solve. Or you can even to submit them for inclusion in the app, so that everyone will be able to play. Now that Blocked is in palms app catalog, the homebrew version doesn't have all the puzzles. If you enjoy the game, I ask that you consider buying the catalog version.